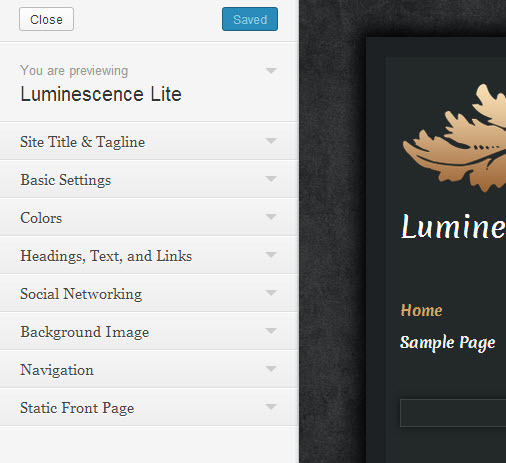 Welcome to the new Luminescence Lite blogging theme. I've gone back to an original concept of old school blogging design, but with a modern twist that brings more to just a standard blog theme. Luminescence offers some unique features whether it’s a personal or business based blog, you will definitely rise to the level of great looks! It's scalable, compatible, and definitely gives you stability by focusing on WordPress standards. Luminescence Lite gives you flexibility and variety when it comes to customizing your own website to suit your personal style. With the available theme settings, you can tweak several styles like logos, backgrounds, and of course, create an unlimited array of colour combinations right from the built-in WordPress Customizer. Creating a personalized website using Luminescence Lite gives you the ability to create a unique style so that you do not look like other websites that use this template, right down to the smaller attention to details that this theme offers. 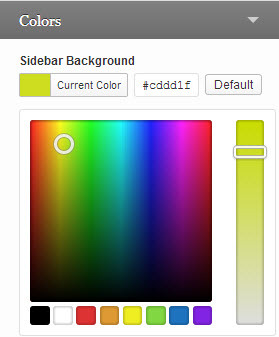 Activate the Luminescence Lite and Click on “Customize” in the Appearance Menu in the Dashboard. To edit the content of theme. If you change themes later, you don't lose anything because the plugins stay with you with each theme you use, but if they were in the theme, you lose whatever content or functionality you had with the theme. Remove Widget Titles - For any widget that you want the title removed but still keep a title for reference in the admin side, this one hides the title by adding an ! before the title. Jetpack - A combination of various plugins rolled into one. Use it to edit your theme CSS, create a contact form, and more. Dynamic Widgets - Dynamic Widgets gives you full control on which pages your widgets will appear. It lets you dynamicly show or hide widgets on WordPress pages. This is used extensively in the demo site to achieve the widget positions each widget it published to on select pages. You have two places you can access the Customizer. Option One is to click on the big button in the Dashboard once you log into your admin. Option Two is to go to your theme page. If you plan to customize your theme by making changes to any of the core theme files, even the style.css file, WordPress and Styled Themes recommends you use the Child Theme method instead of directly modifying the actual theme files. If you update a theme and you made modifications, guess what will happen? Your modifications will be totally lost and you will have to do it all over again. However, if you make your modifications using a Child Theme, then your changes will not be affected whenever you update the original theme (often called the Parent Theme). Whenever the Luminescence Lite theme is upgraded, your Child Theme and all of your modifications will be safe and remain unchanged. To help you get started, I've made a custom blank child theme for Luminescence Lite which is ready for you to make any changes to your theme. Start by getting the child theme from the Luminescence Lite theme folder where you will find the installable zip file. 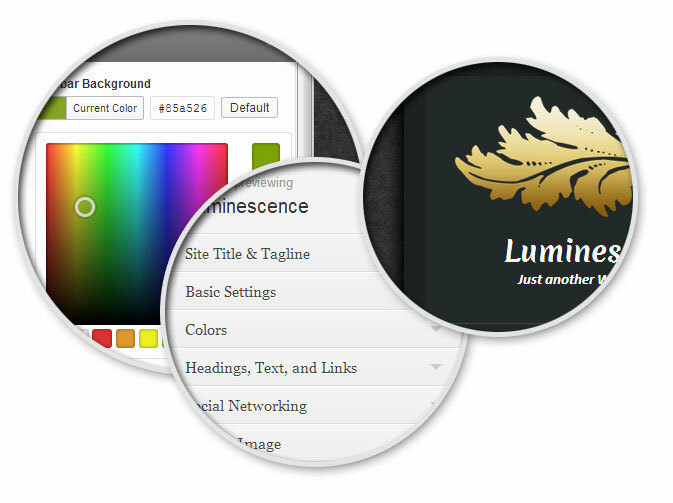 Luminescence Lite includes an installable child theme already made for you. You can find it in your theme files within a folder named "child-theme". Because it's a zip file, you can install it just like any theme by using the WordPress installer. Once installed, activate it and then you can make your changes to most theme files, including the style.css. Please note that you need the parent theme installed first before installing a child theme. So in this case, you want Luminescence Lite installed first, then you can add the child theme for it. You are not just limited to css, but you can also modify the layout structure of theme files and templates as well. The child theme includes folders which match what the parent theme has (Luminescence Lite) so then what you would be doing is copying the file from the same location in the parent theme of Luminescence lite, then pasting it into the child theme (same location) and then make whatever changes you want. If you are using or plan to use the JetPack plugin, you may not need the child theme. This is because JetPack includes a nice CSS Editor built in that lets you manage a theme's stylesheet without the need of a child theme. The only caveat of this is that if you plan to modify any of the core theme files, either aside from or including the style.css file, then a child theme will be required. The JetPack plugin only lets you modify the stylesheet only. The most annoying thing with WordPress is that they have a set group of dimensions for images already in place when you install WordPress. What happens when you upload a photo, you will get several thumbnail sizes created automatically - whether you want them or not. This is a major problem for many because eventually your host server will get filled with unused images which take up a lot of server disk space. You don't see all your thumbnails except just one in the Media Library of your site's admin. But, if you were to go to your "uploads" folder through your FTP, you will get a shock of your life when you see how many images are there. So...before we continue on with setting up Luminescence Lite, we will change the default settings of WordPress so that this does not happen to us, although changing these settings is optional. Last, there is a setting option to place our images into dated folders...to me, this is messy, but if you "need" your photos in specific dated folders, then keep it checked, otherwise uncheck this. This will then put all your images into one folder only. For any site, I would recommend cropping and sizing your photos as you need them before uploading so that you have full control over how your photos look and manage file size as well with optimization. I generally don't set any dimension in the Media Settings because of my encounters to do my own thumbnails. Much more control that way. Again, I will assume you know the basics of WordPress, but I will go through the setup for this theme. 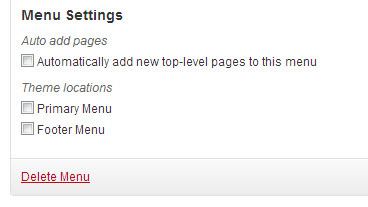 Then at the bottom, you should now see a box that is labeled as "Menu Settings". In the Menu settings, select the location, in this case the "Primary Menu" location, and then click "Save"
Now you can begin adding items to your new menu...don't forget to click "Save Menu" whenever you make a change. Part of WordPress includes a "Header" feature that lets you upload and crop photos that you can use in a header of your page. Before in the past the header would have the site title and description on top of it and you were able to change the background of it. Well things have changed and advanced to a point that you can use the header in many ways, whereas for Luminescence, you get to use it as a type of showcase banner for your pages. The first is clicking on the "Header" link in the left panel in your dashboard under "Appearance". When you are in your dashboard, this is going to be the fastest way of accessing the setup of your header. The other will be accessing your theme's customizer by clicking on the text link labeled as "Customize" or when you are in the main Dashboard area (home page of your admin) you will can click on the big blue button labeled as "Customize this site". I always recommend people prepare their images before uploading, such as cropping, sizing, and optimization. However, this tutorial is more about getting your images into your showcase header, but the WP Header feature still gives you a reasonably good cropping tool. For size of images, I recommend using large 725 pixel wide dimensions so that when the image is cropped and published, you can retain a good quality photo. 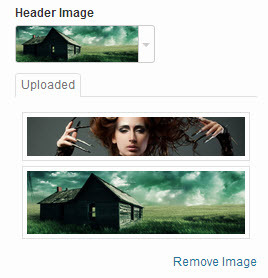 Please be aware that WordPress does not resize images to be "bigger", but rather they make them smaller. My rule of thumb is the bigger the image, the better. Click on the tab labeled as "Header Image"
If you wish to upload a different photo, you will need to use the other method of managing he headers because WordPress has not made the upload and cropping method available through the Customizer yet. With any alternate thumbnail choice that you select, click Save & Publish, then Close to get out of the Customizer. You control the colour with the inline styles that you see. You can change the background and the colour of the text to your own personal preference to allow greater flexibility. If you decide you don't want to use your social networking icons, or just a temporary change to disable them, you can disable the social bar from being seen on the front-end of your site. Put a check in the box next to "Hide Social Bar"
Simple to change colours for the background, the icon itself, as well the hover colour. These are not image icons, but rather they are a font called Genericons, which makes it easier to customize the colours of each one. One of the best features of Luminescence Lite (all my themes) is that you can modify the colours of almost every element within your page(s) with a colour selector that is already part of WordPress. 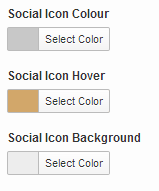 I simply added more colour selector fields based on what elements you can change to suit your own preferences. Note: If there is something you want to change that is not available from the theme options, you will then need to customize the style.css then. There are other customizer tabs that contain colour selectors, such as the Headings, Text, and Links, plus the Navigation, and the Social Networking tabs. The default gallery shortcode that is part of WordPress is extremely limited and getting a good looking gallery in conjunction of working with WordPress thumbnails is a nightmare because there was not enough thought that went into this available feature. However, with Luminescence, I did a little extra customization for those who want to use the default WordPress gallery in their website by stripping out the built-in styles they use and opted in for my own. It's not perfect but it still looks good without the need of a plugin. As I will keep saying this on all tutorials relating to images, prepare your images by cropping, sizing, and optimizing your photos before uploading. I also recommend making your images the same dimensions if you can so you keep a consistent layout and size with each image, but this of course is not required. For this tutorial, we will do this with a page, but you can also do it with a post if you want. Save the photos and if you know how to optimize photos, I would recommend it, but I would also recommend not sizing your photos too big so that they will fit in the viewable browser window without scroll bars. Save your photos to a folder or other location where you can grab these in our next step. Title your page as "Gallery" or whatever you want, then click on "Publish"
With your editor still open, we will start by clicking on the "Add Media" button. Click on the "Upload" option, unless you already have your images loaded in the media library...I prefer uploading them here though. 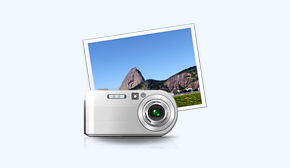 Once your photos are uploaded, you will have the original size of each. Each gallery image will show a checkmark on each photo thumbnail which you can now decide if you want to use a caption and set any other attributes per image. For now, we will just do an ALT for each and a caption for each. We do this by clicking on each thumbnail. Once you click the "Create a new Gallery" button, a new page is displayed which lets you choose how many columns you want when your gallery displays in your page or post. For this tutorial, let's just do 4 columns and Link it to the Attachment page. Now we can click "Publish" or "Update"
I added the class "image-glow" to the end of the string of other classes showing. 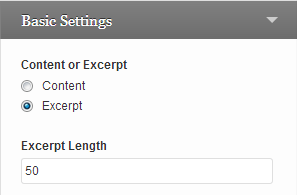 This is a new feature that was add to Luminescence Lite, and gives you the choice of either Content or Excerpt for your blog posts. By default, this theme gives you the excerpt method, but you can go into your theme options and change this.